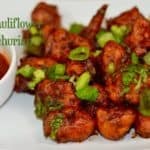 Gobi or Cauliflower Manchurian is one of most popular appetizer from Indian-chinese cuisine.It is usually served as a starter or side dish for fried rice or noodles. Mix all the ingredients under the batter section and make a bhaji/pancake consistancy batter adding little water at a time. Make sure your batter is smooth without any lumps. Add Cauliflower florets into the batter and deep fry till crispy and golden in color. I fried them in 2 batches,do not overload just add 7-8 florets at a time. After all the florets are ready. Set them aside on paper towel. Furthermore, add onion and capsicum. Saute for 30-90 secs. Add in all the sauces one by one, then add in vinegar and keep tossing the mixture. Finally add the fried cauliflower floret, salt (if required) and toss with the sauce for 2 mins. Add coriander/cilantro and spring onions. Give it a final toss and serve immediately. 1. If the cauliflower has too many insects, you can parboiled cauliflower florets with a pinch of salt and turmeric powder.